Most don't like the Havoc because it's silly. I agree, it is. The front has two people lying face down protected only by glass, and the actual driver sits in a big chair above the thing *completely* exposed to any and all enemy fire. Not exactly designed very well. It has lots of room for figures with running boards at the rear and sides. Although, with the missiles pointing backwards (why this is I have no idea) anyone riding on the rear or side boards with either be impaled by the missiles or fried to a crisp when they launched. Plus with figures on the runner boards, you can't launch the little hover pod. The engine cover and tread covers do come off, so you get added play value because of that, but they don't add up enough to make this thing highly sought after. So you can still get the regular Havoc pretty cheap since they produced the thing in seemingly huge numbers. 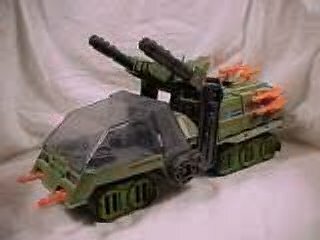 I've always liked the Havoc and it's counter part the Sky Havoc, but the way this thing is designed it's really, really, silly and impractical.